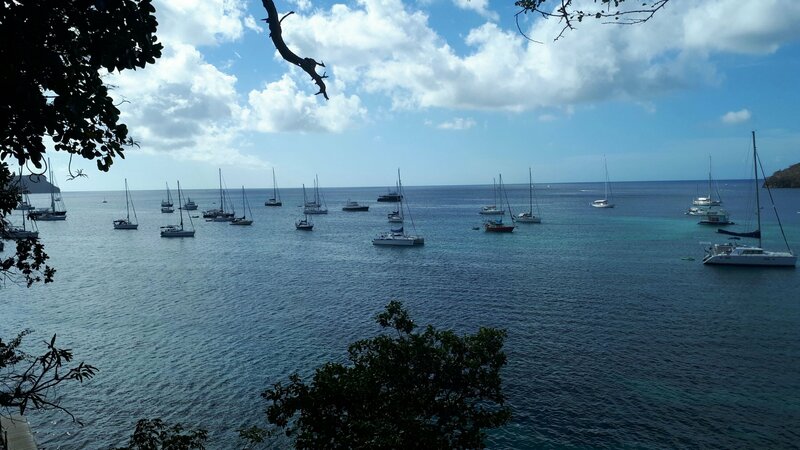 We were tacking against the wind up the Bequia South Channel when we saw a few boats anchored in front of a small island. The anchorage was shown in our charts as having good holding so we decided to stop there for the night. As soon as we anchored two of the three other boats left so there was just a Canadian yacht and us anchored off this small uninhabited island. We are not in Germany so, even anchored in the middle of nowhere, we had fast Internet and could do a quick bit of research. The island was until recently a whaling station with this being one of only four places in the world where locals can legally hunt whales. It is called Petit Nevis and is currently for sale for fifteen million US dollars. We went for a swim with mask and snorkel and were amazed at the amount of life we found under us living on the rocky bottom. Neill had never snorkelled before and was really excited. Heidi had been before in Venezuela and was a bit more relaxed. But we both agree, we need another mask and snorkel. The next morning we rowed across to the ruined jetty and went for a walk round the island. 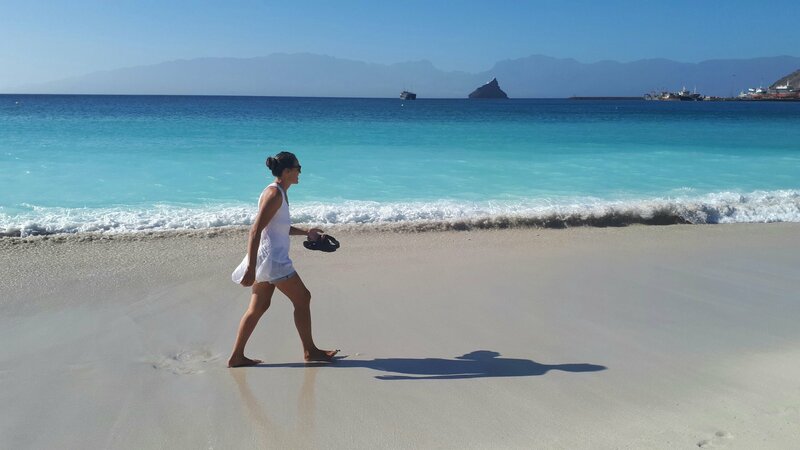 It has one idyllic beach but other than that is volcanic rock, cactuses and scrub. Yes it has a view to Mustique but we both agreed we wouldn’t be putting in a bid to buy it. Actually we can’t understand why anyone would buy an island. It isn’t like a boat that gives you freedom. it is just a lump of roxk that ties you down. 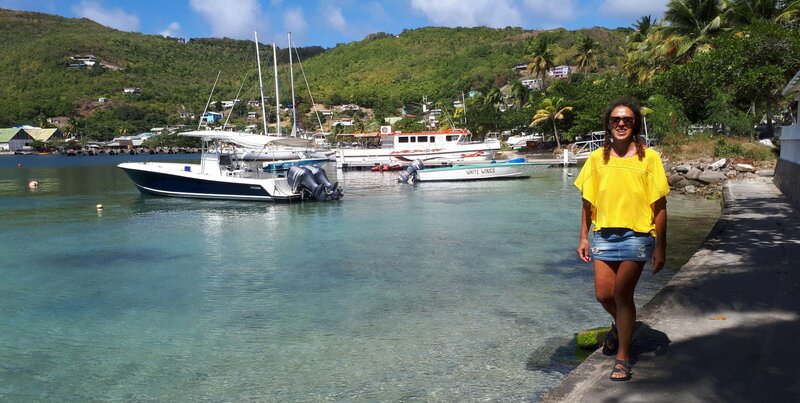 Early yesterday morning we sailed in to the bay at Port Elizabeth on the island of Bequia and in to the real Caribbean. The bay is surrounded by wooded hills spotted with wooden houses. At anchor there are many boats and locals float past selling water, ice, diesel, laundry services and taxi rides. As we entered the bay a passing diving boat shouted across the water “welcome!” We passed what looked like an outing of the Royal Yacht Squadron all flying their white ensigns. Maybe that explains all the chaps called Julian and Rupert in town. We anchored in see through water and dived on the anchor to check it was firmly in the sand. With the dinghy we rowed the short distance to the beach and then walked along to the customs house arriving just after they opened for the afternoon. Customs gave us a yachting permit for a month (which we can extend) and at the next counter immigration gave us six month visas. It all took about fifteen minutes and they let us pay in Euros. Next stop was a mobile phone shop where we bought two SIM cards. We now have St. Vincent and Grenadines telephone numbers, 8GB of data, an hour of free Youtube a day and a flat for local calls. We can spend all day ringing each other or make some local friends quickly. The locals all seemed friendly. Mostly they were sat in the shade selling stuff. We bought a local courtesy flag which is flying on our starboard spreader and some mangos & oranges. On the way back along the beach we stopped off under a huge tree for ice creams and beers while watching the locals repairing a boats engine while stood chest deep in the sea. In the evening the beach bar turned the music up and we fell asleep rocking gently in paradise. After eighteen days at sea, it was during the night that Heidi spotted the lights of Martinique. A few hours later we rounded the southern tip of the island and then set course for Le Marin and arrived shortly before sunrise. I doubt we have ever seen so many boats at anchor. The bay is filled with vessels in all directions. Here there is everything from super-yacht to barely floating hulks. We found a space and, after over 2000 miles and one Atlantic crossing, dropped our anchor. After tidying up and pumping up the dinghy we motored across to the marina and “cleared in” online using a computer terminal in the office. This is civilized! No police, no customs and no immigration. Martinique is part of France and therefore part of the EU. The currency is Euro, our European SIM card (and data flat rate) works and the language is French. All the comforts of home but T-shirt weather. The second day we went shopping. The local supermarket has a car park out front and a dinghy pontoon at the back so you fill up your trolley and then cross load it in to the dinghy. Totally organised, totally stress free and fun. Once we got back with our two hundred Euros worth of shopping we created a spreadsheet that shows what we have stowed where. We are really getting organised. On Saturday we took the dinghy across to the garage on the marina hammerhead. They sell petrol for the outboard, gas for the cooker and water at 2 cents a liter. You can tell that yachts are big business here and life is made easy for us cruisers. 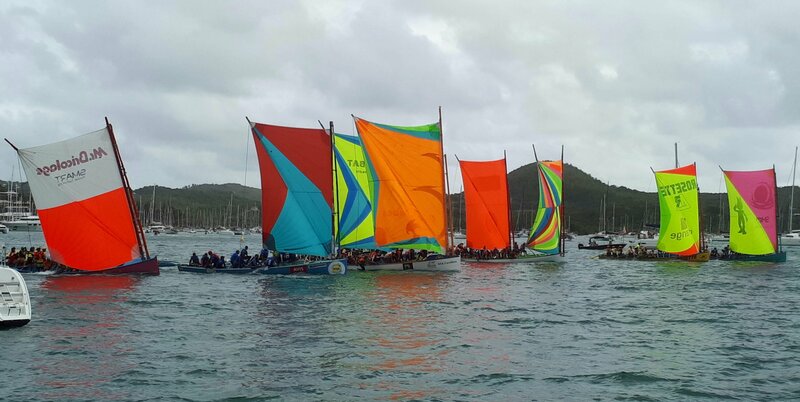 Later we went across to the beach and watched a local sailing race with boats where half the crew sit out on outrigger poles to keep the sail vertical and three men paddle with the steering oar. We also drank the local Ti-Punch during a torrential downpour and listened to the drums playing on the beach. After Cape Verde the rain is taking some getting used to. Le Marin isn’t a pretty town but a great place to arrive, do the admin stuff and prepare for more adventure. Eigentlich hätte alles ganz easy beginnen sollen, Räder abholen, Fahrkarten kaufen und los gehtˋs. Denkste !! Wir standen an der Ticket Ausgabe und dann erklärte uns die Dame – keine Fahrräder !! WAS????? Wir hatten ja extra am Tag vorher nachgefragt, da hieß es kein Problem – so was machen wir jetzt, Hotel gebucht und wir kommen nicht weg. Doch unser freundlicher lokaler Helfer Chida hat mich mit den Fahrrädern durch die Gepäckabfertigung geschleust und ging zurück zu Neill, teilte den Leuten dort mit, dass die Räder bereits auf der Fähre sind und dann haben wir doch tatsächlich die Fähre noch bekommen und konnten auf der grünen Insel radeln. Nach einem mega anstrengenden Anstieg von 1400 Höhenmetern zum Vulkan auf durchgehendem Kopfsteinpflaster waren wir echt am Ar… – ich weiß nicht ob es daran lag, dass es nicht einmal eben oder nur ein bisschen bergab ging – keine Ahnung, aber wir wurden mit einem wahnsinnigen Blick über den Kraterrand und die darunter liegenden Felder belohnt. Wir fanden unser Hotel – nach nochmal 150 Höhenmetern extra – und ließen uns mit Wein und lokaler Küche verwöhnen. Nach einer ausgiebigen Nacht-Ruhe genauer gesagt nach 12 Stunden schlafen machten wir uns auf den Rückweg; Neill hat auf GPS einen Trail gefunden und wir wollten doch nicht den gleichen Weg zurück. 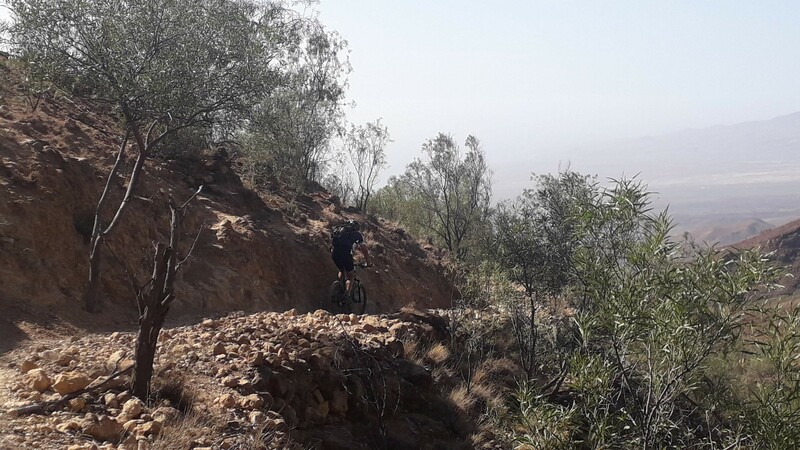 Wir umrundeten den Krater dann radelten wir auf immer enger werdenden Wegen bergab; Die Trails wären vielleicht von Gremmel und Wera zu fahren gewesen, aber wir haben doch viel geschoben, da es an der Seite ganz tief ins Tal ging. Nach ca. 500 Höhenmetern bergab war der Weg aus – keine Möglichkeit über das Tal auf die andere Seite zu kommen noch sonst irgendeine Chance – also alles zurück schieben bzw. tragen und dass bei 25 ° und strahlendem Sonnenschein. 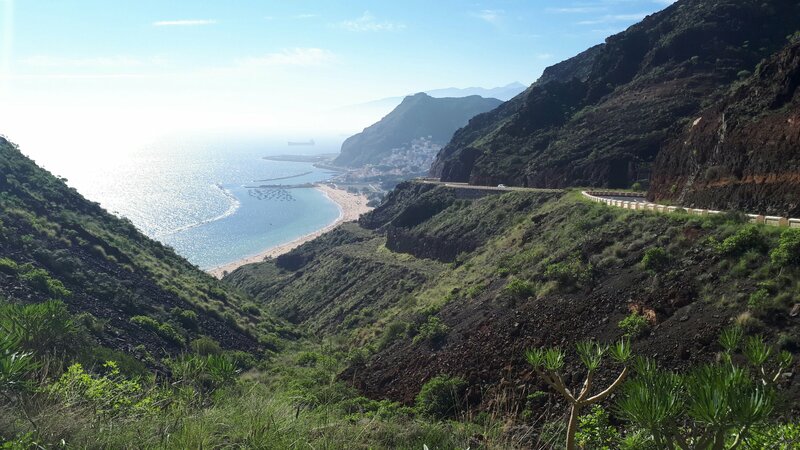 In Gedanken sahen wir unsere Fähre schon ohne uns nach Mindelo fahren und uns nochmal ein Hotel suchen :-(. Doch wir haben die 1400 Höhenmeter Kopfsteinpflaster in einer Rekordzeit von 35 Minuten geschafft und gerade noch unsere Fähre bekommen und wieder ein Abenteuer mehr überstanden. At the end of the last blog entry, we had just dropped anchor in the dark off Mindelo and fallen in to bed and a deep sleep. Obviously we weren’t awake with the sunrise but some time later. 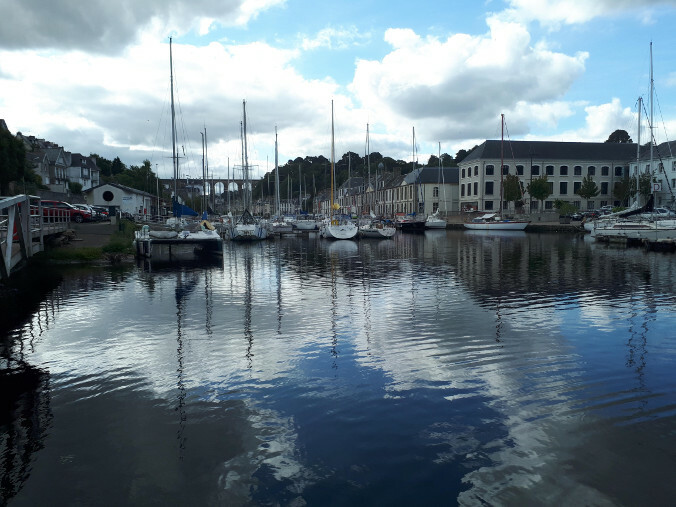 When we got up and took a look outside we were presented with a colourful town, a bay surrounded by barren hills and lots of yachts at anchor. And lots of sun and wind. We moved Artemis nearer land and amongst the other boats. We recognised Riki and Martin’s “aracanga” and their friend’s boat “Streuner” so anchored near to them. Once we had the dinghy out of the locker and the outboard attached, we discovered that the propeller was siezed. No problem; we are young and fit and rowed to the marina office. They told us that the shop next door would service the motor – on Monday – and immigration may be open – on Monday. Life in Africa is slow and relaxed. At least we found an open supermarket where a friendly sales assistant installed local SIM cards in our phones and got us online. On Sunday we spent most of the day cleaning as much of the Sahara off the boat as possible. We washed everything in salt water and then cleaned all the ropes with fresh water. Artemis once again looks presentable. A friend from home wrote that he had friends currently at the marina so we contacted each other. 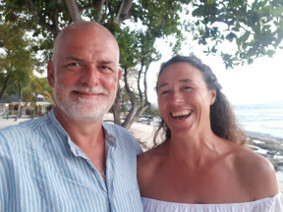 In the afternoon, after the cleaning and a warm solar heated shower, we rowed over to say hello to Christina and Martin and ended up leaving again just before midnight. A great evening with two really nice sailors. Monday just after eight we reported to immigration and received two visas stamped in our passports for a grand total of five Euros. Then on to the maritime police to clear the boat in to the country. One formular and no Euros. Everything quick, efficient and easy. We were on a roll so we filled up with water for one cent a liter at the fishing club, found some one to look at the engine and bought a new bottle of camping gas. Then collapsed in to bed for Siesta. Today was New Years Eve so we met up with Christina and Werner again and waited for midnight. We knew when it was without a watch. Both ferries were sounding off their horns, people were using up out of date flares and the town put on a great firework show. Straight after a concert began in the middle of town in the closed off streets. Big stage, huge speakers and thousands of people. Everyone from toddler to grandparents and every outfit imaginable from cocktail dres to diving suit (honestly). We watched people and enjoyed the music until past two in the morning. 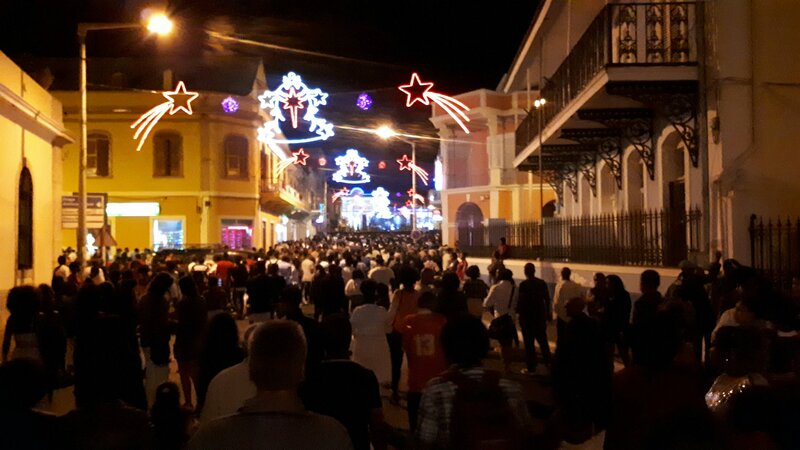 In Mindelo they know how to party. As we write this we are sailing south along the coast of Tenerife on our way south to the Cape Verde islands after spending two months in the Canary Islands. Before we came here, we had read about all the problems that we could expect. Anchoring, they claimed, is forbidden nearly every where and you will be moved on by the police. The marinas, they said, were always full and wouldn’t let you in without a reservation. The swell, they warned, is awful and the wind mostly too strong. Luckily, against all this advice, we sailed to the islands and have had an enjoyable stay here. We never booked a marina and at four out of five we turned up unannounced and were given a berth. At the fifth marina they would have allowed us to raft up even though they were full, but the strong wind had already ripped cleats off the pontoon and was threatening to increase. We had to agree that staying there was impossible. The marina staff were all friendly, professional and helpful. Often they were hampered by bad computer systems but they worked round them. We spent a week in mainland Spain and felt totally confident leaving Artemis (and Max) at Santa Cruz Marina. We spent over twenty nights at anchorage at a selection of beautiful anchorages (and the less lovely anchorage at Las Palmas). There was always a bit of swell but only one night was bad enough to deprive us of sleep. A few nights we had winds of up to twenty knots but, with our Rocna anchor, that was no problem and the wind generator charged the batteries. We saw a patrol boat moving boats without permits on in a national park but we were never disturbed by harbour officials or the police. Neither did we meet anyone who had been moved on. 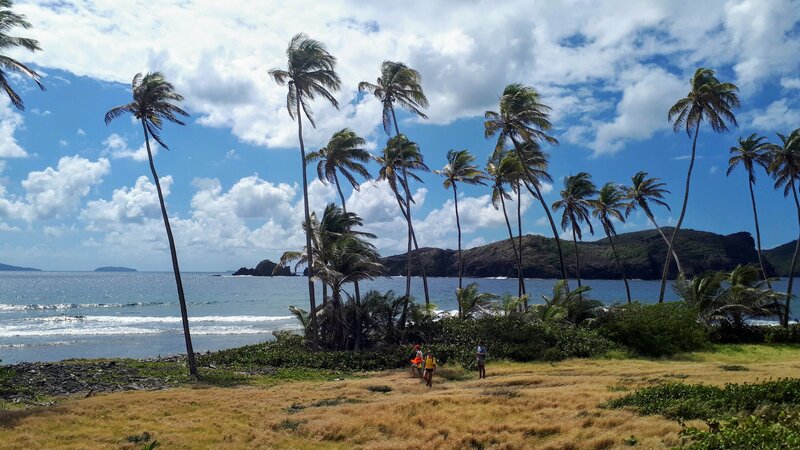 It is true that there is often plenty of wind, particularly in the acceleration zones where the venturi effect between the islands adds to the wind speed. Fighting wind and swell can be less enjoyable than a downwind cruise but any sailing is better than motoring. As we already wrote, we needed work doing on the boat. We can vouch that there are skilled tradesmen on Tenerife and are sure there are good people on Gran Canaria. Everyone we met in the two months were friendly and polite and, even if they only spoke spanish and didn’t understand us, willing to help. Originally we had planned on stopping off at the marina in Porto but, when they emailed us to say it was €44 a night, we went to Póvoa de Varzim just up the coast. Here it costs less than half the price and the train to Porto is €2.80. Additionally the staff are extremely efficient and very friendly and there is a Honda dealer to service our outboard after we dropped it in the sea. Yesterday we caught the train to Porto for a day of “big town” tourism. The journey was through miles and miles of corn fields and past the huge aquaduct we had cycled past the day before. The aquaduct is 4km long and was built to carry water from a spring to a priory. Any one caught stealing water from it was excommunicated. There was no messing with the church back then. In Porto we visited churches, the town hall, a monstrous bridge, the old town and a station. It was a bit of a shock to suddenly be surrounded by busloads of tourists feom all over the world and people trying to extract money from the tourists. The station we visited had tiled frescoes showing the history of the city and waves of tourists. In the cathedral a baby was being baptised amongst a river of tourists. Do the locals get annoyed or do the just stop noticing us? 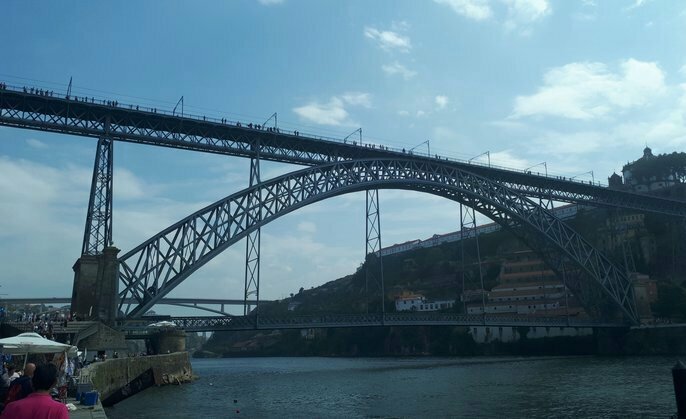 The bridge was sixty meters high and offered stunning views of the surrounding city. 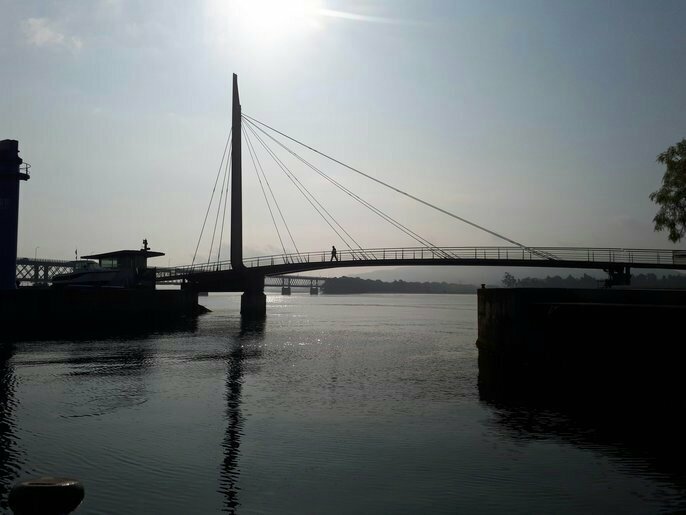 It is a tram bridge and regularly trams would pass ringing their bells and hoping every one got out of their way in time. We ate in a cafe on a street one back from the riverside but still paid a lot for a little. Living in small harbours and fishing villages, we had forgotten what happens to prices when tourism occurs. By mid afternoon we had all had enough of city life and took the train back to the “real world”, peace and quiet. We al three agreed that citys are not for us. Finally we have left Portugal – on the second attempt. The first time there was no wind so we gave up just before the border and spent the night behind the harbour wall at the spanish border town of La Guardia. 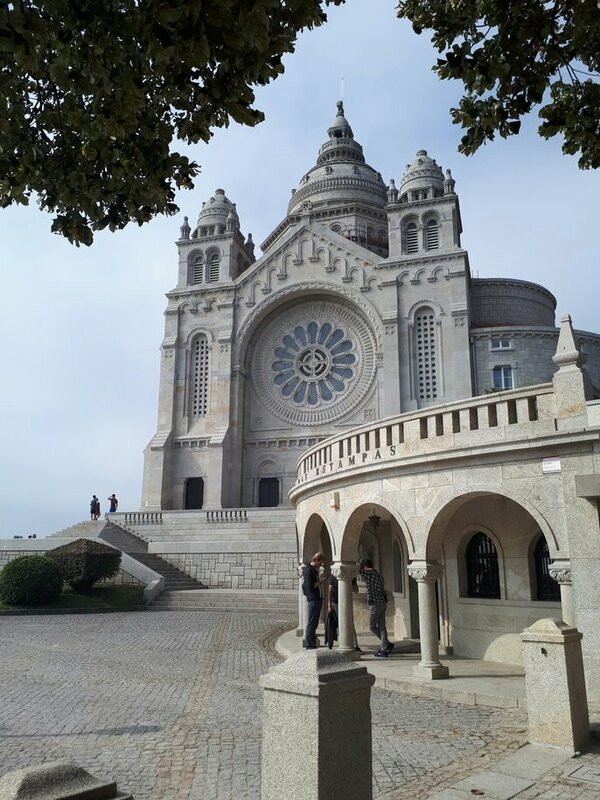 The next day there was still no wind so we gave our motor a day out and motored south over the border and in to the town of Viana do Castello. To enter the marina they have to swing an elegant cantilevered footbridge so we agreed to stay the night on the “reception pontoon” out in the river under the shadow of a railway bridge designed by Gustav Eifel (of parisian tower fame). 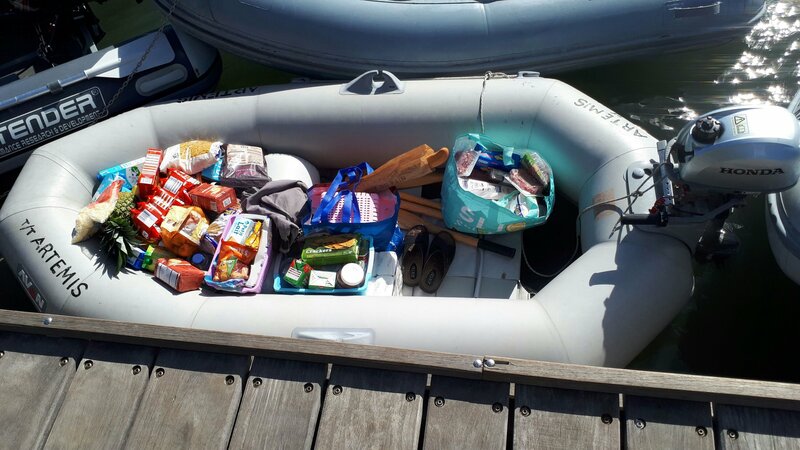 We immediately swung in to action and aired all our cushions and bedding, cleaned the dinghy and went shopping to restock our supplies. As more and more boats arrived we were asked to move in to the marina. By now it was getting dark, windy and we wanted to go and eat. I was unhappy but we agreed and thus had our first attempt at bow to, mediterranen mooring. Cleverly, we had Max waiting on land so it wasn’t too dramatic. Once again Max did a great job of finding a superb restaurant at a reasonable price. We celebrated our arrival in Portugal with Caipirinha, Tapas and a portuguese lesson from the waiter. The building that houses the restaurant is built of absolutely massive stone. The walls are over a meter thick and the ceilings are stone beams on stone lintels. No wonder they don’t need air conditioning here. As we were sailing south, we saw the imposing Saint Lucia Basilica set on a hill behind the city. This temple was built at the beginning of the twentieth century and can be seen from far out at sea. Obviously in the morning Heidi and Neill climbed the never ending staircase to reach it and, because the 200 meters of climbing was such fun, they then climbed to the very top of the temple as well. The view, despite the haze, was amazing. Once back down in town, we wandered the old town, drank a Cappuccino (paid for with the money we saved by not using the funicular railway to reach the temple) and then went back to the supermarket to stock up on wine. Back at the boat, we gave the decks and sides a wash and then left through the swinging bridge and headed back off down river and south using the afternoon wind. After our long and somewhat circuitous journey from Guernsey, we were anchored in a bay at the mouth of a river next to a fort built to keep the marauding English away. The next morning there was no wind and none expected that day so we decided to take a tour up river. The river is tidal but at high tide there was going to be plenty of water so we left early and followed the rising water upstream. To begin with we passed a small fishing village and it was immediately obvious we were in France – you don’t see louvred shutters in England. Then the river became much narrower and we were sailing along with cars passing us on the roads on each side. We waved to the occasional cyclists and they returned our greeting. There is something very surreal about travelling on a 36 foot sailing yacht through the middle of the french landscape waving to passers by. A few times we nearly touched the mud below us but with a rising tide we were all in chilled mode. We passed under a huge bridge that carried the motorway over us and then rounded a bend and saw the lock in to the town harbour ahead. 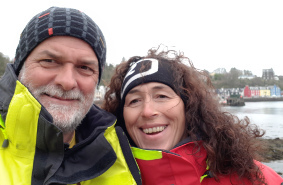 We began preparing to tie up to the chains hung on the wall but the harbourmaster came jogging out to meet us and told us we could enter the lock immediately. Luckily his English was better than our French so he was able to explain where we should berth and give us a little map so that we couldn’t get lost. With the exception of Porthmadog he was the only harbourmaster we have met to be so well organised. Must be a celtic trait. Having spent a morning being tourists we buckled down to some serious cleaning, deck scrubbing and anchor chain remarking (thanks Max) before rewarding ourselves with a bottle of wine with dinner and another glass at the harbour side bar. It’s a tough life in France. Yes there is really a village called Mousehole. It is on the Cornish coast, the location for a great child’s book and last night we anchored just off shore in sun and no wind. I had always imagined that this village would be a tiny collection of fisherman’s cottages hidden in a small, well sheltered creek. The fisherman’s cottages are there. They are clustered round the beach and now all seem to be holiday homes or artists studios. The streets are tiny and were obviously planned when a boat was much more important than a car. On the surrounding slopes the cottages are now crowded by newer, less picturesque dwellings so that the original character of the place is lost when viewed from the sea.